JULY 24, 2015, DIAMONDHEAD, Miss. (NNS) – Naval Small Craft Instruction and Technical Training School (NAVSCIATTS) graduated 95 international students from 14 partner nations, July 23, at the Diamondhead Country Club. The class included students from Cape Verde, Colombia, Costa Rica, Dominican Republic, El Salvador, Guatemala, Honduras, Mexico, Nicaragua, Panama, Paraguay, Peru, Trinidad and Tobago, and Uzbekistan. The students graduated from nine separate NAVSCIATTS courses that encompassed the Instructor Development Course, International Tactical Communications Course, International Patrol Craft Officer Coastal Course, Patrol Craft Officer Riverine Course, International Small Arms Maintenance Course, Diesel Systems Overhaul and Maintenance Course, Technical Welding and Applied Repairs Course, Outboard Motor and Maintenance Overhaul Course, and Unmanned Aerial System Operations and Planning Course. Cmdr. Clay M. Pendergrass, commanding officer, NAVSCIATTS, said the graduating students represent the best of their countries, he congratulated them for their hard work and professionalism. Capt. 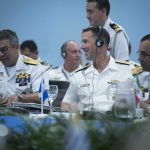 Rene Merino, the head of the Salvadoran Navy, and one of the graduation ceremony’s guest speakers, emphasized the importance of maintaining ties and good relations with foreign nation partners. NAVSCIATTS is a Department of the Navy schoolhouse operating under the United States Special Operations Command. NAVSCIATTS trains and educates partner nation security forces on a wide range of topics, including small craft strategy, operations, communications, weapons, maintenance, and instructor development. Since 1963, nearly 11,000 students from 113 partner nations have graduated from NAVSCIATTS. Courses are offered in English and Spanish, or in other languages through the use of translators.